By taking away from the fixtures their architectural clothing (the column that pretends to support the bowl of the sink, the collars in relief that encircle its contours), one arrives at the true form, Ponti said in 1955 (but he had already done it in 1936, with the SVAO fixtures for Montecatini. Here the column of the sink is a simple casing (that conceals, not supports). 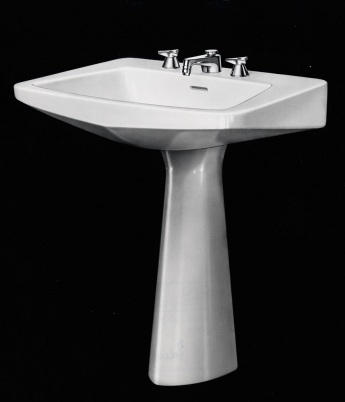 The basin of the sink- smooth, with no projections is trapezoidal, a shape that leaves room for the arms when washing. Ponti also designed the faucets (for Gallieni, Vigano', and Marazza): stars with only three points, as they are turned with just three fingers. Ponti was to design a new series of fixtures for Ideal Standard in 1966, the Oneline series.Ponti's collaborators: George Labalme, Giancarlo Pozzi, and Alberto Rosselli.